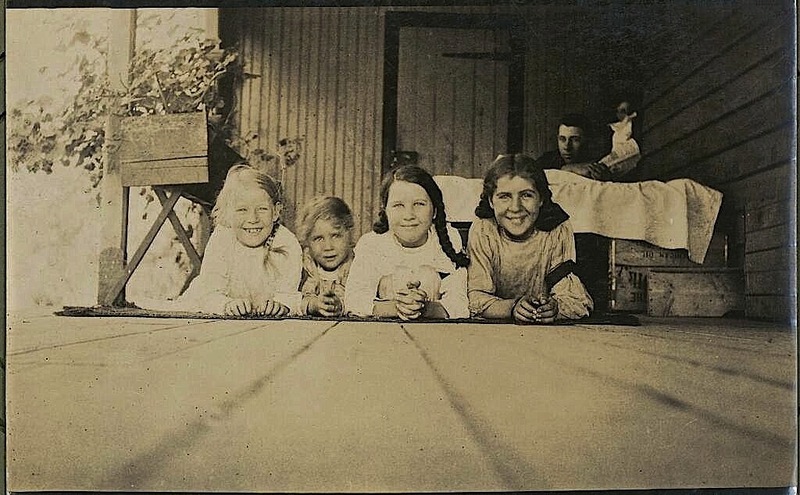 “Portrait of four girls and a man on a verandah,” Dubbo area, New South Wales, ca. 1915, by Edward Challis Kempe, via National Library of Australia Commons on flickr. I wonder if those are scented geraniums in the planter on the left? The Rev. E.C. Kempe was an amateur photographer and principal of the Brotherhood of the Good Shepherd at Dubbo from 1912 to 1915. The Good Shepherd was one of several “Bush Brotherhoods,” Anglican religious orders that sent traveling priests to thinly populated rural districts. “They were described as a ‘band of men’ who could ‘preach like Apostles’ and ‘ride like cowboys’,” according to Wikipedia. Kempe left behind an album of 157 photographs from his time in the bush. “House Verandah. 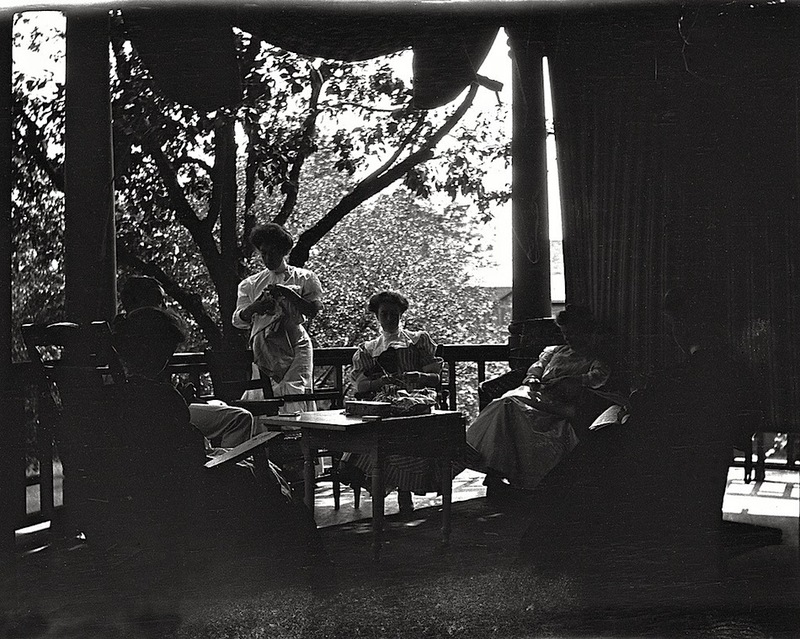 Mother, Winifred, Helen & Mrs Kingsmill,” Deseronto, Ontario, July 1908, via Harold McMurrich Rathbun’s Negatives album, Deseronto Archives Commons on flickr. The Rathbuns were a prominent family in Deseronto. About the time of this photo, The Rathbun Company owned a local shipyard and saw mill and a number of other businesses. At least two of its men had served as mayor around the turn of the 20th century. However, markets changed, woods stock were depleted, and fires destroyed their docks and other property. “[The] core timber and minerals resource businesses were dead by 1916 . . . . The company surrendered its charter in 1923,” according to Wikipedia. More well-furnished porches in Queensland, Australia. 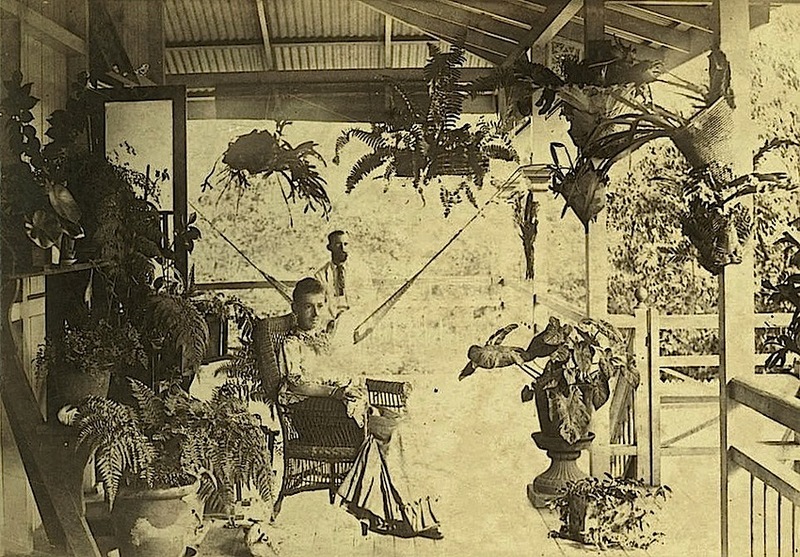 . .
“Verandah at The Hollow, near Mackay, Queensland, about 1875,” photographer unidentified (all photos here), via State Library of Queensland Commons on flickr (all photos here). I love the office setup on this very deep porch with an adjoining fernery or bush-house. 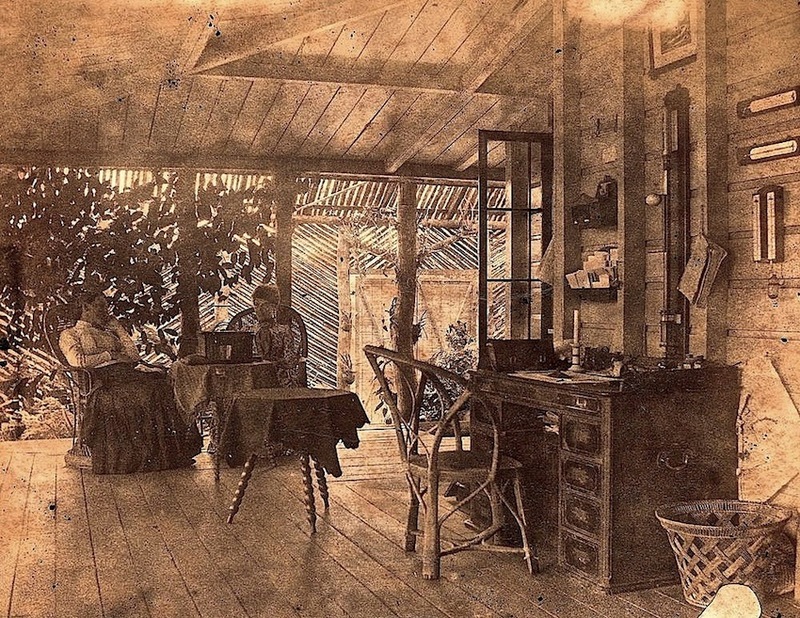 There is also a sewing machine on the table between the two women. These photos are not very clear, but you can click any thumbnail in the gallery below to scroll through larger versions. There are four additional pictures there too. What a beautiful plant collection. “Furniture on the verandah of a Queenslander home, ca. 1925,” photographer unidentified. 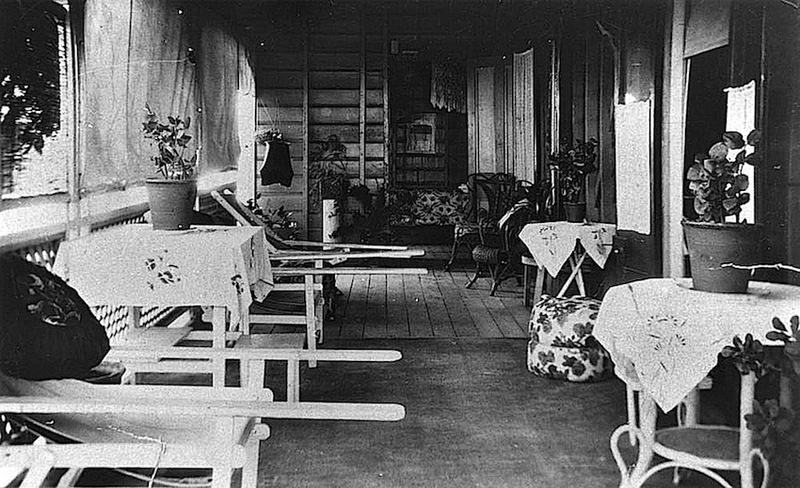 The white chairs on the left with the extended armrests are “squatter’s chairs,” typical to Queensland porches. There are two more examples here. 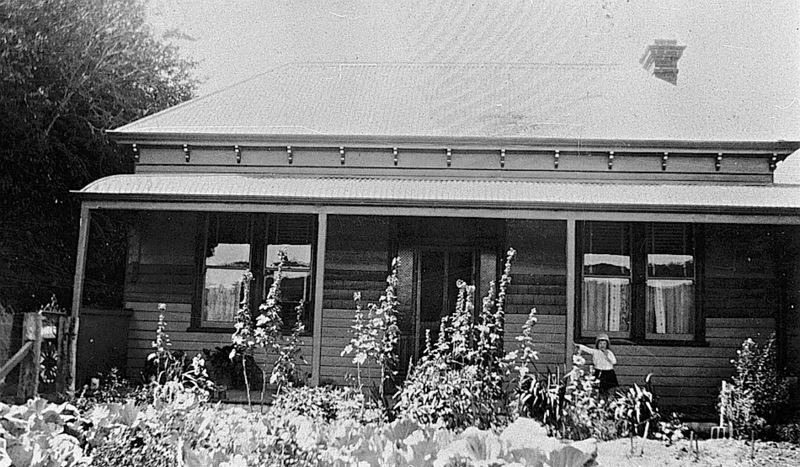 “Verandah of Gracemere Homestead, near Rockhampton,” ca. 1940.